The Order of Malta is over 1000 old and, after a long and complex history, has been in Rome (click here to see the map... just in case you need it!) for the last centuries. But the aim of this page is not to explain te history of the Order, eben if you can find some frequently asked questions about it at the bottom, but to show its plates: as a sovereign entity it has got its own license plates on the roads! First of all the exact meaning of the letters S.M.O.M. : most people say that it means "Sovrano Militare dell'Ordine di Malta" (Sovereign Military Order of Malta), but Frà Karl Paar, member of the Order, told me that it stands for "Servizio Militare dell'Ordine di Malta" (Military Service of the Order of Malta). 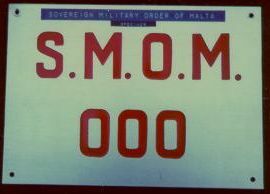 It's important to notice that the vehicles with SMOM plates are not the official vehicles of the Order of Malta because they have standard Italian diplomatic plates with the letters XA at the end (see table). 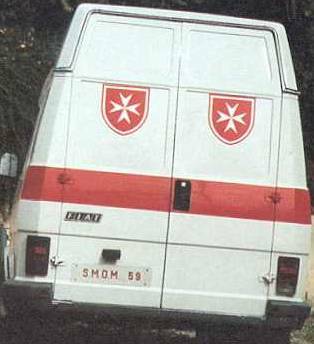 On the contrary, these special plates are used on the vehicles of ACISMOM, the Association of Knights of Malta, that includes also a "Military Corps": at the beginning it had war purposes, but today it's used for civil protection and for disaster relief (see pictures 5 and 6) working in co-operation with the Italian authorities. Indeed, the SMOM plates are issued by the Italian Minister of Defence, and so somehow they are part of the Italian license plate system, but anyway their shape is far different from any other Italian plate, as you can easily see in the pictures, and they are not totally Italian. SMOM plates have been around approximately since the Second World War, but I don't know the exact year yet. You can meet SMOM plates only in Italy (as said they're part of the Italian license plate system): they all are made and controlled in Rome and then distributed to members in other Italian cities. There are about 100 SMOM plates around, all looking like the same as you can see in the pictures: the word SMOM in red and then the number. At the beginning the number was also in red (pictures 1, 3, 4 and 6), then it became black (picture 2 and 7). In the past also the background changed, from metallic (pictures 3 and 6) to white since the 1980s (pictures 1, 2, 4 and 7); moreover in those years the size of the plate changed from two lines (pictures 3 and 5) to just one line. Numbers start from 1 and go up serially (there's no proof about this, but sounds reasonable because large numbers have never been issued). 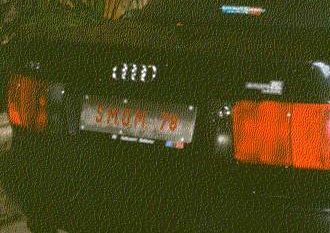 The same number can be issued to different cars, even if not at the same time (thanks to Guglielmo Evangelista for this detail): you can see an example of this in the old photo gallery (picture 12). I tried to make questions about the numbers, but I had no reply, probably because the military use of these vehicles requires a bit of secrecy. Anyway I was told by some people that the President of ACISMOM uses the plate with number 1 because he's the person responsible for the territory, but other sources tell me that the Grand Priory uses the plate number 1. From the sights of Guglielmo Evangelista I know that the plate with number 1 was first mounted on a Fiat 1800, later on a Fiat 125, a Fiat 132, a Lancia Prisma and last on two different Lancia Thema's. For sure there are some sample plates of the Order of Malta and you can see one of them in the third picture (many thanks to Jim Fox! ), but I was told by people working for the Order that they don't exist and that it has to be a fake. On the other hand, I have strong proof that it is not a fake: so maybe that sample was made in the past, but is not official or known today. If you want to find other plates of this kind, go to the page of sample plates. 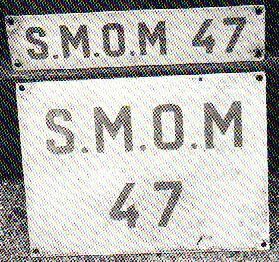 Another strange thing about SMOM plates: some plates seem to miss the dot after the second "M" as you can see in one of the forth picture (many thanks to Maik Knoll for the picture, even if the quality is poor). Probably this is due to the low number of plates made and so each new plate is slightly different. In the past, about from 1945 to 1970, ACISMOM had also another kind of plates with two crosses on them. The first of them was red, placed inside a circle and had a white backgound and Guglielmo Evangelista told me that it should be the Cross of Jerusalem, used also on the uniforms of that time. The second cross was white on red background and is knows as Cross of Malta because is the coat of te arms of the Order of Malta. In the pictures number 8 and 9 (many thanks to Ernesto Vitetti who sent them to me!) you can see respectively a rear and a front plate of this kind. This is a list of addresses of buildings owned by the Order of Malta. I found most of the information written above at the first of these, even if the main building of the Order is that in Via Condotti. If you are interested in the history of the Order of Malta or in its current purposes and status, you can find some useful links to a lot of interesting material in the page of links. My advice is not to write them asking for sample plates for your collection because they are not issued. Even if I didn't ask it directly, I suppose that there isn't any SMOM oval available. But I think the plates make it clear enough! Moreover I don't think there's any SMOM plate for motorbikes, while I've heard of some test plates. I would like to thank Rev. Father Gerard Lagleder for pictures number 1, 4 and 6 and his help in the research about SMOM plates: you're so kind!!. 1. What is the Order of Malta? The Sovereign Military Hospitaller Order of St. John of Jerusalem of Rhodes and of Malta (the full name of the Order) is both an ancient order of Chivalry and a religious order of the Roman Catholic Church. It is also a sovereign subject of international law. 4. How large is the Order of Malta and where is it located? The Order of Malta is international, having over 11,000 members world wide, 3,000 of whom are in the United States. The headquarters of the Order is in Rome. Through national associations, priories and humanitarian projects, the Order has a presence in 130 countries around the world. 10. Is the Sovereign Military Order of Malta really a Sovereign entity? Yes. Throughout the Order s 900 year history through its existence, legal basis, persona, collection of rights, powers, privileges and immunities, the Order has acquired the status of a sovereign entity and subject of international law under canon law, Papal grant, jus gentium, the divided legal system of mediaeval Christendom - sacerdotim and imperium, feudal law and the modern classical system of International law. Currently, as in the past, the Order enters into treaties with sovereign states; it issues its own passports, coins its own currency and prints its own stamps (having postal conventions and treaties with 45 countries). Today the Order is recognized as sovereign by more than 70 countries, who have reciprocal diplomatic relations and exchange ambassadors with the Order. On August 24, 1994, the Order was granted permanent observer status in the General Assembly of the United Nations with the sponsorship of 71 member countries. 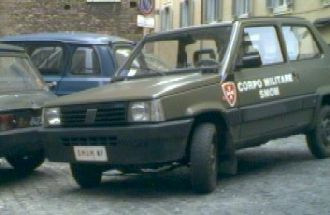 The Order is also a member of the United Nations Educational, Scientific and Cultural Organization (UNESCO), The Council of Europe, The World Health Organization (WHO), The Food and Agriculture Organization (FAO), The Commission of the European Union, and maintains a delegation to the International Committee of the Red Cross (ICRC). However, the Order is not dependent upon this recent recognition for its sovereign status, having established its persona before the national States existed and before the modern international organizations had been born.